hrc | six words to change the world. nom’s anti gay marriage ad…terrifying. There’s a new anti-gay marriage ad out there, and it is terrifying. I’m not scared of the storm. I’m scared of NOM. I’m scared of their bad actors (and they are actors. See their audition reels here. Thanks, QT!). I’m scared of their bad writing (ex- “There’s a storm gathering. The clouds are dark, and the wind is strong. And I am afraid.” You are afraid of weddings? Seriously?). But most of all, I’m scared of their message of hate and discrimination. You know what I think of when I think of NOM? A lot less scary than some crap a dark storm and a bunch of lies (click that link and read what HRC says. ), don’t you think? blogging from the dnc, day 3. Yesterday was day 3 of the girl power hippie lovefest. And oh girl, it was a good one. I’m going to try and keep it quasi-brief. Brevity really isn’t my thing though. I went to a tea hosted by Nancy Pelosi to honor to women in Congress. I was fairly dressed up, but some of the women looked absolutely absurd. It was like 2 p.m. and they had gotten their hair did. Whatev. The first speaking guest is introduced. The woman standing right next to me steps up onto the stage. I had been standing next to Annette Bening the entire time and didn’t even know it. Whoops. She was wearing glasses, okay?! Harder to recognize her… I don’t know. Next up to speak was Nancy. The word I always use to describe her is ‘lovely’. Really, she’s quite classy. And during her speech, she announced that Rosario Dawson and Eva Longoria Parker were there. Excuse me? Rosario is hot. Eva is pretty. Enough said about that. As if things couldn’t get any better, Idina Menzel comes out and sings an acoustic “Defying Gravity” from Wicked and a song that she had written. While she was singing, I was busy looking around for her smokin hot hubby, TAYE DIGGS. AHHH. No dice. Didn’t matter– she was amazing. We were herded like cattle to the Pepsi Center for the delegate vote. Instead of just giving the numbers from the vote, every state made a long speech bragging about how beautiful they were. And I swear, at least three states claimed to be the first state the sun touches each morning. Somebody was lying. I bet it was Maine. I kid. Barack is getting the majority of votes, with some Hillary supporters sticking to their guns. Some states, like California and Illinois had passed. Weird. New Hampshire, New Jersey…everyone is waiting for New York…New Mexico. New Mexico yields to Illinois, Illinois yields to New York. And our girl Hilllllllz steps out to clean up the mess. How dramatic (and symbolic)! She asked that B be announced the winner. She shoots, she scores. Euphoria ensues. People are awkwardly dancing. All the speeches were good, but some were better than others. My dad and I were discussing how DNC speeches made by unknowns are really just screen tests. I mean, Barack passed his in 2004, didn’t he? So look out for Rep. Patrick Murphy from PA. He did great. Melissa Etheridge played, more awkward dancing occurred. You could tell people were gearing up for the Democratic savior and the Republican satan, Bill Clinton. He came out swinging for B. And it was genuine. Billy’s still got it. He focused a lot on world diplomacy during his speech. Seriously people treated him like he was Jesus. John Kerry spoke. Some other people. And then Beau Biden came out. Beau, Joe’s son, is a complete dreamboat. Seriously foxy. RAWR. I was weeping when he talked about his mother and sister being killed in the car accident, and how Joe Biden never left their side. Of course I cried when Sen. Biden came out and hugged his son. I have cried more times in the past couple of days than in the past couple of years. 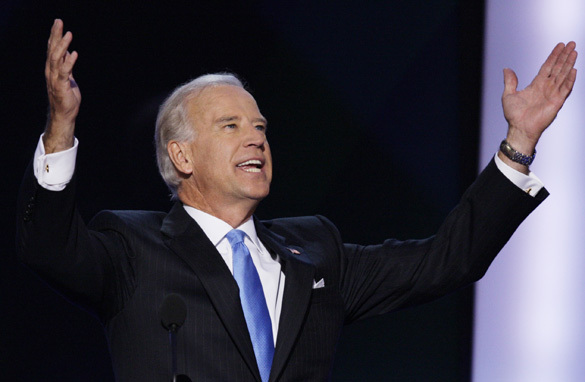 By now we know Biden’s story, but every time I hear it I am convinced more and more that he will be great. And he’s really living up to his role as an attack dog. Slap old Mac around. His wife, Jill, came out at the end and said she had a surprise. Who could it be?! Joe Jonas? Ben Affleck? GEORGE CLOONEY?! And then Barack stepped out. AHHHHHH. People were having political strokes. I wish I could really convey the electricity of the convention last night. Oh! I saw Mohammed Ali last night! Just walking around the convention with his posse. Pretty cool. After the convention, I ended up hanging out with people Mallory went to high school with. I still miss you Mal. And now I totally get all of her Denver stories about burritos and bicycles. The big speech is tonight. Still looking for George Clooney. i'm getting tired, i'm forgetting why. kerry's not just a democratic partier. dan humphrey is hot, the end. jamie lynn is officially a mother. hmm... what ever happened to t.A.T.u. ?